In a large bowl, sift together the flour, baking powder and cinnamon. Stir in the sugar and lemon zest and make a well in the centre. Add buttermilk, yolks and vanilla, stir until smooth, stir in apple. Set aside to rest at room temperature for 30 minutes. Meanwhile, for cinnamon sugar, combine ingredients in a bowl, then spread on a tray and set aside. Preheat oil in a deep-fryer or deep-sided small saucepan to 180°C/350°F. Whisk egg whites and salt in a bowl until firm peaks form. Fold one-third of egg white into apple mixture to lighten, then fold in remaining egg white. Spoon rough quenelles of mixture into hot oil, in batches, and cook, turning occasionally, until golden and cooked through (2-3 minutes; be careful as hot oil may spit). Drain in paper towels, toss in cinnamon sugar and serve hot. I love fritters of all kinds. 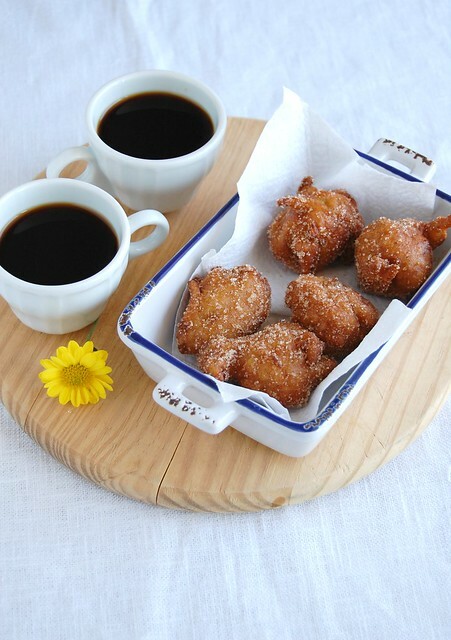 Hence, I love almost anything fried so these fritters are right up my alley! I miss you! I've tried other fritter recipes and they were hard and just not very good. Just made these this morning and they were WONDERFUL!!!! Hey, there - I'm so glad you like the recipe, tks for letting me know how the fritters turned out!